Sylvia: "Are you writing in a journal, Mom?" Pearl: "Yes, I am, Sylvia." Sylvia: "That's so old-fashioned! You should be writing a blog instead." Sylvia: "Yes. A blog is basically a journal that is available on the internet. Someone who keeps a blog is called a blogger." you'd blow into a hankie." I love it! I agree with Pearl on this one. "Blog" has the same negative connotation to me as the word "jog." Both are so common and almost demeaning in my twisted perception. I even felt that way 30 years ago when I first began running. No matter how slowly I now run, by gosh I'm still a "runner," not a jogger. And since we have our own website, not a blog on someone else's website, I don't consider this journal a "blog" nor myself a "blogger." I love writing this journal, even though I often fall behind. As several folks have told me, including Jim, it's better to be out there living life than writing about it. Not satisfied with just one of those alternatives, I want both. Gee, do you think Jim can relate to this?? The journal has brought us new friends all over the world since we launched our website in 2005. It's a way to keep our friends and family apprised of our whereabouts and some of our activities. It also gives me an outlet for my itch to write and take photos, two hobbies I can continue enjoying even as my running "career" diminishes in intensity and importance. To my immense frustration I can't keep up with Jim on most of our runs but I can still savor the scenery and capture the experience with my camera as I walk and slowly run (not jog!!!) along. We've been busy enough since we returned to our home base in Virginia that I've gotten 'way behind on this journal. My intent here is to catch up a bit with what's been going on (related to running, hiking, and traveling) since we got back in March. I'll begin in this entry with our tentative summer race and travel plans and an update on our training since the beginning of the year. In subsequent entries I'll talk about an important hiking milestone a friend reached recently, a new physical challenge I'm facing, preparing for our summer trip, and comments about turning 60 a month ago. Until now I've deliberately avoided posting our race schedule for the rest of the year because it keeps morphing. Not only does Jim keep adding more races to his agenda, but my own plans have been thrown off because two of my intended winter races have been cancelled this year, both essentially victims of the lousy economy. One cancellation was announced publicly in mid-March (Sunmart). The other hasn't been publicly announced, only to the race committee, so I cannot mention it here yet. I'm still hoping that one gets reprised, even if it is in a different location. The demise/hiatus of these events has thrown me into more of a tizzy than Jim because one of them was to be my goal race for 2009. Jim has so many interesting and challenging races planned this summer and fall that he's not all that concerned about winter races yet. 7/17 Tahoe Rim Trail, Lake Tahoe area, NV, 100 miles (Jim), 50K (Sue) - Jim's oldest son is also running TRT, his first 100-miler! In September and October we're considering working and/or running a few more races in the Rockies and Midwest before returning to Virginia briefly to deal with the leaves falling on our lawn and roof (gotta find a solution to that dilemma when we get back). I won't mention the specific races since we haven't officially entered any of them yet. All of the races listed above involve mountainous courses that reach altitudes much higher than we can find in Virginia. We can't easily train for altitude at home this spring but we can find plenty of short and long grades in the Blue Ridge Mountains to simulate the terrain we'll encounter in the Rockies. 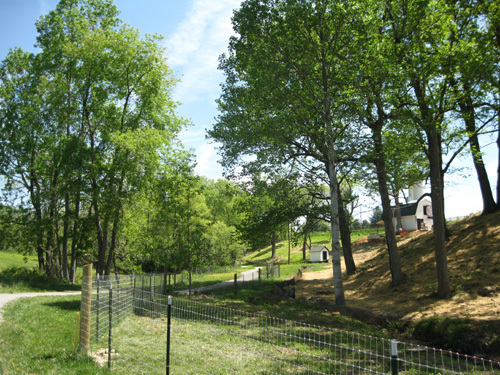 Roanoke's March and April weather has been typically variable, from cold and damp to hot and muggy. There has been a lot of much-needed rain. That's spring in Virginia, nothing unusual, so we've been able to train any day we've had the time and motivation. 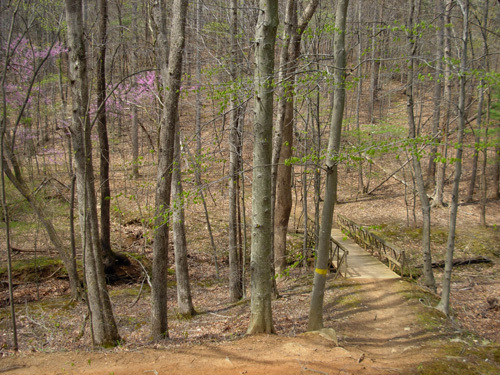 Fifty miles on the smooth, undulating trails at Umstead helped Jim log time on his feet and forced him to run a little faster than he would run in a gnarly mountainous race. 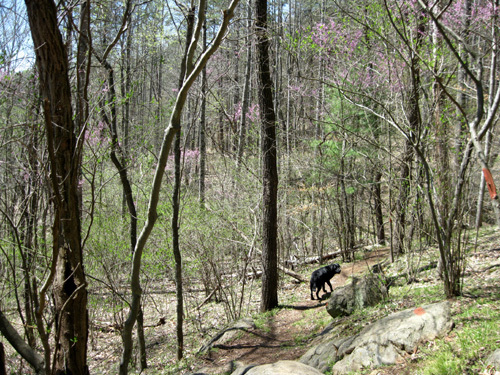 Promise Land, while not as long, gave him additional mountain training to supplement his hilly runs at nearby Explore Park and Stewart's Knob. I keep encouraging Jim to train on the Andy Lang Trail near Roanoke or The Priest, a mountain farther north on the Appalachian Trail that David Horton uses to train for Hardrock and other difficult Rocky Mountain races. 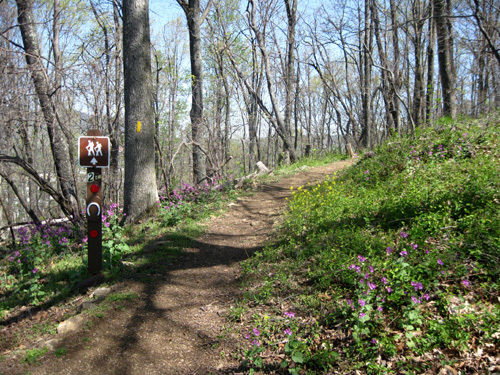 Both trails have significant climbs/descents over about three miles. Neither of us took that opportunity this trip home, however. 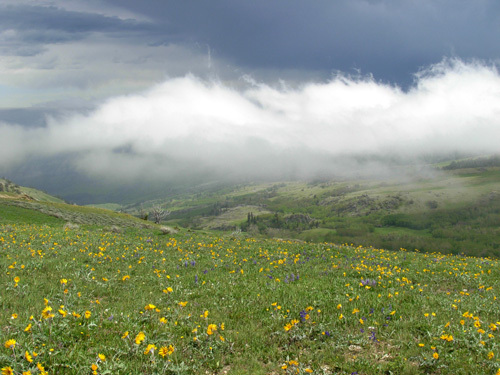 Jim feels the hilly terrain at Stewart's Knob, Explore Park, and on the Promise Land course (which he's run in training three times and during the race last week) are sufficient until he can get back to the Rockies. He'll get plenty of tough mountain terrain and elevations up to and over 10,000 feet in the Jemez Mountains in northern New Mexico and the Bighorns in Wyoming in a couple of weeks. Jim is mostly pleased with his training distance and intensity since ATY. He believes he is better trained than he was this time last year and is optimistic about the races he plans to run. He has run from six (rest week after a race) to 70 miles a week since the beginning of the year and from 100 to 212� miles a month. He estimates a total of 190-200 miles in May. He has been able to avoid any illnesses and injuries for a year or more, which helps him to train consistently. Although Jim is registered for the 100-miler at Bighorn he is considering changing to the 52-miler there so he will be more rested for the Tahoe Rim Trail (TRT)100-miler a month later. Both are tough races with plenty of elevation gain and loss. His oldest son, Jimmie, is also running TRT. It's his first 100-miler. It's very special when a father-son duo runs the same ultra, especially one this long. It'll be fun to visit with Jim and his family, who live fairly close to the race course. 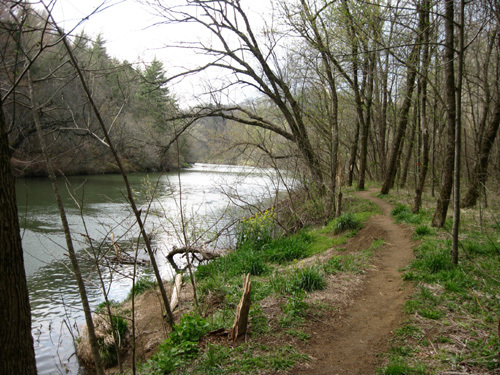 Most of my training miles the last seven weeks in Virginia have been on the relatively flat section of the greenway system in Roanoke that is dirt/crushed rock and not paved. I run there three or four days a week. At least once a week I train at Explore Park or Stewart's Knob to get in some hill training without straining my knees too much. I definitely need to ramp up training on hills and mountains before the Bighorn 50K next month, however. My goal the past few weeks has been to gradually increase my mileage and work on steady stretches of running for 20 minutes at a time. That's more easily accomplished on the smooth, rolling Wolf Creek Greenway than the rougher, hillier trails at Explore and Stewart's Knob. 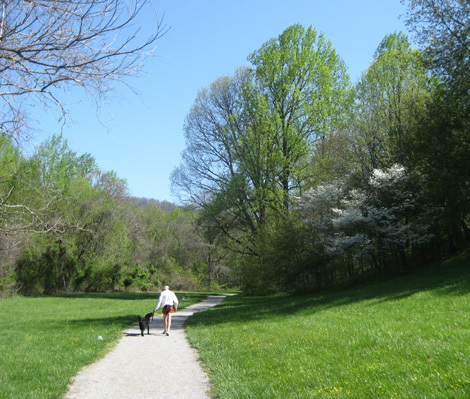 I do more running than walking on the greenway, more walking than running at Explore Park. My weekly running and walking mileage since the beginning of the year has ranged from a low of 20 miles to a high of 51 miles. I've done only one race during that time, and don't have another one planned until mid-June. I've increased my monthly miles gradually from 132 in January to 157 in April. I estimate a total of 160-170 miles in May, although that will be more difficult because of travel time and the need to find suitable trails in New Mexico and South Dakota before our arrival in the Bighorn Mountains of Wyoming later this month. I figure I can find plenty of hills and mountains in those locales to prepare myself adequately (although not optimally) for the Bighorn and Tahoe 50Ks. Both races have very generous cut-off times so I can walk as much as necessary. My plan is to train enough to avoid muscular-skeletal injuries like Achilles tendonitis from over-extending myself during those strenuous races -- but not training so much on steep hills/mountains that my knees hurt. After recemtly talking with a woman in physical therapy for two simultaneous knee replacements, I'm in cartilage-saving mode! OK, I admit if I was really in cartilage-saving mode I probably wouldn't be running at all . 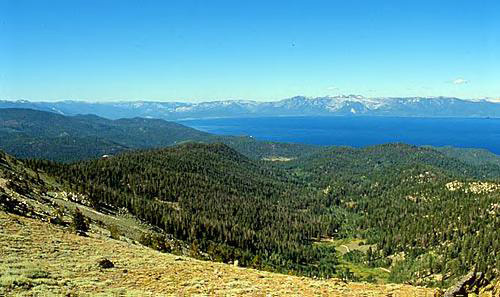 . .
At this point I have no race plans after Tahoe Rim Trail in July. I'm having trouble getting excited about any races this year, mostly because I'm still in denial about my favorite race being cancelled this year. I'm researching alternatives but haven't come up with a suitable one yet. Jim doesn't do much cross-training other than walking. He hasn't ridden his bike since we were at McDowell Mountain Park in the Phoenix area in January. He didn't renew his YMCA membership when we got back to Roanoke but he's done some weight work at home. While we've been in Roanoke I've worked out on the LifeFitness machines at the Y three or four times a week and used some of their equipment for physical therapy that I don't have at home. I haven't done any swimming, pool running, or aerobic machines at the Y this spring. I enjoyed riding Jim's mountain bike at McDowell Mountain Park and at Huntsville SP in Texas during the winter. Since we've been back in Roanoke, however, I've ridden my own road bike and Jim's bike only sporadically, mostly because we've been so busy with other things. I plan to do more cycling when we're on our trip this summer. When we've taken Jim's mountain bike on previous trips we've been able to transport it in the long bed of the F-250. 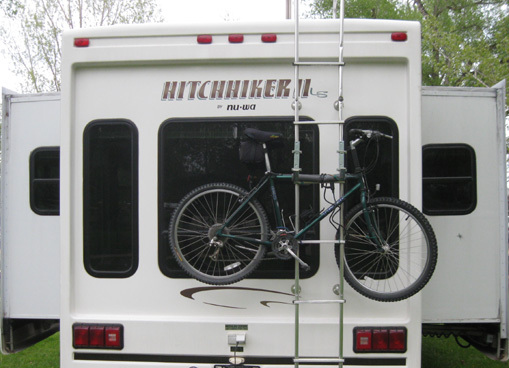 The new Ram truck's short bed doesn't allow space for it, so we hunted locally and online for a suitable bike carrier that would attach to the ladder on the back of the camper. 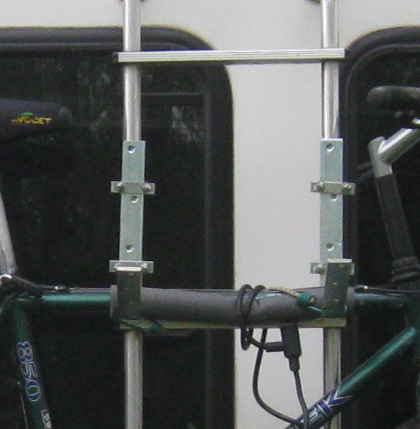 We couldn't find anything but very flimsy racks to mount on ladders, and rejected the other types that mount on the truck roof or bumper receiver of the camper for various reasons. You remember that quote about necessity being the mother of invention? Well, Jim cleverly fabricated a sturdy ladder-mounted rack for a mere $9 that should work perfectly! That saved us $40-50 for a flimsy commercial ladder mount and up to $200 for a sturdy receiver-mounted carrier. Jim's got the bike tightly secured with several bungee cords so it doesn't slam against the back of the camper even when -- not if -- we hit bumps or go over curbs. (As much as we try to avoid going over curbs, it occasionally happens with a long camper.) There's even room for my road bike if we decide to take it on another trip. This summer we're taking just the less expensive Trek mountain bike again because it's more versatile and less likely to be stolen than my spiffy Terry road bike.